Last week, Verité Research began a four-part series on government progress in fulfilling commitments in UNHRC Resolution 30/1. By co-sponsoring Resolution 30/1 in 2015, Sri Lanka committed to a range of measures on human rights, accountability and reconciliation. Sri Lanka’s progress in fulfilling its commitments will be discussed on March 20, 2019, at the 40th session of the UNHRC. This article focuses on commitments related to rights, the rule of law, and international engagement. The government made fifteen commitments on rights and the rule of law. 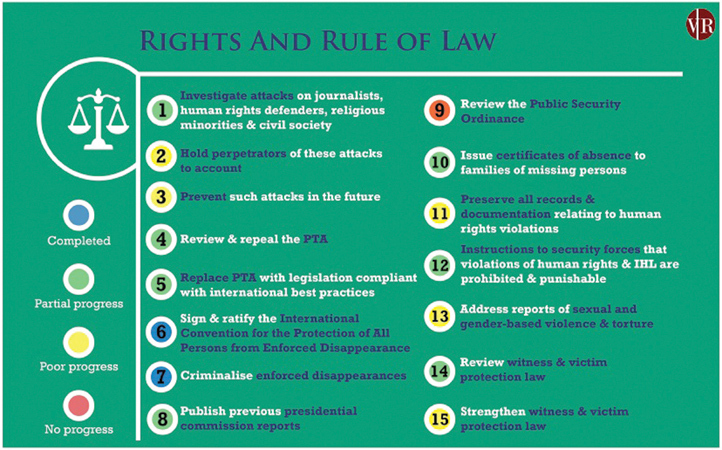 These include reviewing, repealing and replacing the Prevention of Terrorism Act (PTA), criminalising enforced disappearance, and investigating attacks on journalists, human rights defenders, religious minorities and civil society. As at March 2019, two of the fifteen commitments in this category have been fulfilled (See figure 1). Sri Lanka criminalised enforced disappearance by enacting the International Convention for the Protection of All Persons from Enforced Disappearance Act, No. 5 of 2018. This law also introduced new procedural safeguards for persons taken into custody, such as the right to legal counsel and to contact a family member. There has also been some progress in issuing certificates of absence. A certificate of absence is issued to relatives of missing persons and affirms the status of victims as ‘missing’. The measure offers an alternative to receiving a death certificate for missing and disappeared persons. By April 2018, the Registrar General had issued 616 certificates out of 827 applications. There has been limited progress in investigations and prosecutions pertaining to violence against journalists and religious minorities. Some of these cases have been subject to interference from the security and political establishment, thus impeding their progress. For instance, the military is reported to have withheld key evidence relating to the 2010 disappearance of cartoonist Prageeth Ekneligoda. Progress in preventing new attacks has also been limited. In February 2019, journalist Nadarajah Kugarajah was reportedly attacked by policemen in Kokuvil, Jaffna. There were fresh outbreaks of violence against Muslims, first in Ginthota, Galle in November 2017, and thereafter in the Ampara and Kandy districts in early 2018. In response to the 2018 violence, the government declared a state of emergency under the Public Security Ordinance (PSO). The PSO grants the president extraordinary powers during a state of emergency, such as calling out the Armed Forces and imposing a state curfew. Resolution 30/1 contains a commitment to review the PSO, but the government is yet to announce clear plans to do so. Progress in repealing the PTA remains slow. The Counter-Terrorism Bill slated to replace the PTA is currently under further deliberations in Parliament, following a Supreme Court ruling that certain clauses in the Bill was inconsistent with the Constitution. The government made three commitments on international engagement: to continue engaging the Office of the United Nations High Commissioner for Human Rights (OHCHR), to cooperate with UN special procedure mandate holders, and to implement specific recommendations made in the report of the OHCHR’s investigation on Sri Lanka (See figure 2). Sri Lanka continues to engage the OHCHR, and has extended invitations to UN special procedure mandate holders. Visits by special rapporteurs have been made in the past four years, with more scheduled for 2019. However, there has been ‘poor progress’ in implementing the recommendations of the OHCHR Report. For example, there has been no progress in enacting new modes of criminal liability, or in criminalising war crimes, crimes against humanity, and genocide. There has also been no review of convictions under the PTA, including those secured through confessions made to police officers during custody. There has also been limited progress in releasing detainees held under the PTA. Over the past year, progress was achieved in fulfilling two of the commitments under the theme rights and rule of law: criminalising enforced disappearance and issuing certificates of absence. Progress in repealing and replacing the PTA, and investigations of attacks on journalists, religious minorities, and civil society has remained ‘partial’. The government continues to engage the OHCHR, but in 2018, did not make any significant improvements in implementing the recommendations of the OHCHR Report. This article will be followed by updates on the other categories under Resolution 30/1.